Senators – especially Republicans – have expressed unease over protesters who have confronted them at their Senate offices, restaurants, airports and even their homes. WASHINGTON – The impassioned fight over whether to confirm Brett Kavanaugh to the Supreme Court has led to heightened security at the Capitol, with some senators using police escorts to shield them from protesters eager to confront them. Capitol police have arrested dozens of people in recent days for unlawfully demonstrating in Senate office buildings. Police have stepped up their presence in Capitol hallways, in some cases blocking news reporters and the public from approaching lawmakers. 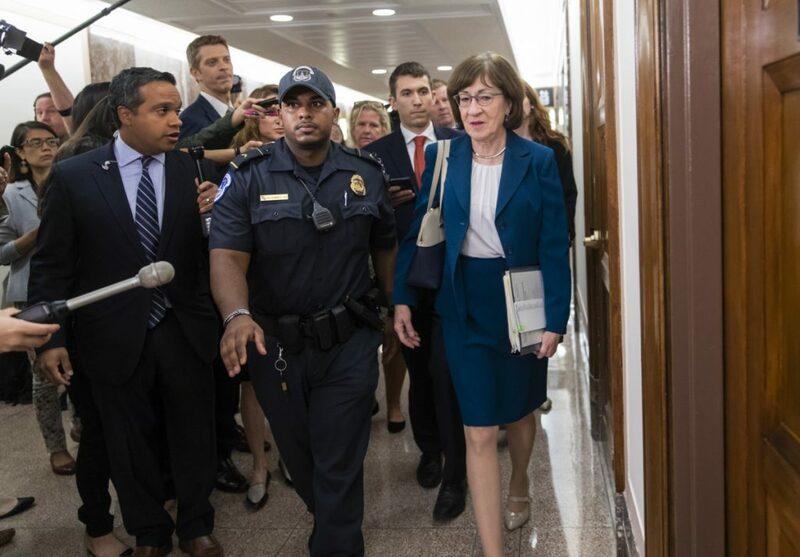 Sen. Susan Collins, a Maine Republican who is a key undecided vote on Kavanaugh, was escorted out of a hearing Wednesday by three police officers. She ignored questions from reporters. 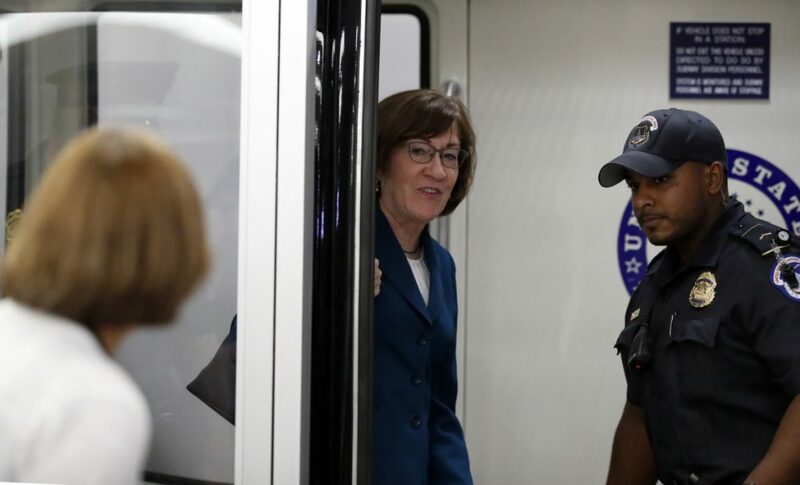 Police later threatened to clear a public hallway outside her office in the Dirksen Senate Office Building and physically blocked reporters from approaching Collins as she left the office to return to the Capitol for a vote. A spokeswoman for Collins declined to comment on her security detail. The stepped-up police presence comes as senators – especially Republicans – have expressed unease over protesters who have confronted them at their Senate offices, restaurants, airports and even their homes. Personal information about some lawmakers also has been released online. Capitol police said late Wednesday they had charged a former Senate staffer with posting private, identifying information about one or more senators on the internet. Jackson Cosko, 27, of Washington, was charged with making public restricted personal information, unauthorized access of a government computer and other crimes. According to Legistorm, a website that tracks lawmakers and Capitol Hill staffers, Cosko worked for Democratic Sen. Maggie Hassan of New Hampshire from January 2017 to May 2018 as a legislative correspondent/systems administrator. Before the arrest was announced, Republicans discussed security matters behind closed doors earlier this week at a private lunch. Senate Majority Leader Mitch McConnell, R-Ky., said in a floor speech Wednesday that senators will not be intimidated out of doing their jobs. McConnell cited an incident in which Texas Sen. Ted Cruz was forced to leave a restaurant last week and said another senator “reported having protesters physically block his car door. And some have seen organized far-left protesters camp out at their homes” and offices. “There is no chance in the world they’re going to scare us out of doing our duty,” McConnell said. He said the Senate will be voting this week on Kavanaugh’s nomination. Sen. Bob Corker, R-Tenn., said there’s “a lot of unprecedented activity taking place” because of the pitched battle over Kavanaugh, who would likely provide the decisive fifth vote for a conservative majority on the nine-member court. The FBI is investigating several allegations of sexual misconduct by Kavanaugh, including Christine Blasey Ford’s accusation that he assaulted her in high school. Kavanaugh has denied the accusations. On Wednesday, two women approached Sen. Orrin Hatch, R-Utah, outside the Senate Judiciary Committee hearing room and tried to give him a statement opposing Kavanaugh. Hatch, who supports Kavanaugh, refused to take the paper and kept walking as the women shouted questions at him and asked why he was ignoring them. The women declined to give their names to a reporter who witnessed the exchange. The protests have been more than just an inconvenience for lawmakers. In at least one case, demonstrators appear to have had an effect on the nomination fight. Last week two women confronted Republican Sen. Jeff Flake of Arizona in an elevator in a televised exchange that went viral. The encounter weighed on him, said Flake, who later forced Republicans to delay voting on Kavanaugh while the FBI conducts another background investigation. A spokeswoman for Capitol police could not be reached for comment on Wednesday. Associated Press writers Alan Fram and Padmananda Rama contributed to this report.